On one side of my driveway there is an old dead tree. A leaning tree. It’s the kind of tree you can tell is hateful and spiteful. It is going to fall down, of course, but it certainly won’t do it on a normal day, like normal trees. No, this tree is going to make his last hurrah on a day when he knows it will hurt you the most. I’m not sure why some trees are like that. It’s hard to know if something bad happened to him in his childhood. Did the oaks bully him? Did little boys like to shoot arrows at him? I don’t know. All I know, is that all summer (and autumn), I’ve been saying to myself and my family that I need to go out and chop him down and put an end to his misery before he hurts someone. The problem is, I haven’t had the time. I’m a busy man. So, I drive past him, we exchange glances, and I hope for the best…for one more peaceful day when he will leave me alone. Well, today, I finally decided to get out my chainsaw and finish him off. Why today you ask? I can assure you that it was something more than my love for fresh air and exercise. You may think I love nothing more than going outside, at 7:00 am, in the middle of our first winter storm, to cut up some firewood. Good guess, but no, something else motivated me. The particular timing today was inspired by the fact that this resentful tree decided to fall across my entire driveway early this morning, completely blocking any vehicles from coming or going. As a writer and speaker, I am blessed (when I’m not traveling) to work from home. My oldest son, on the other hand, has actual skills. He is therefore employed by real people in the real world. So, today, of all days, no matter how inopportune, I bundled up and cut up a tree. If my wife had asked me yesterday, “Do you think you could cut down that old tree tomorrow?” I would have protested with a litany of excuses. I have far better things to do with my time than tend to an old tree. But in less than 12 hours, that tree moved from #150 on my priority list, to #1. This, of course, made me think about all the times I tell my family I can’t do something with them because I am…wait for it… “too busy.” Is it true I don’t have time to take them fishing, or to listen to my little girl struggle to read me her phonics book? No. It simply isn’t true. It “feels” true, but it isn’t. 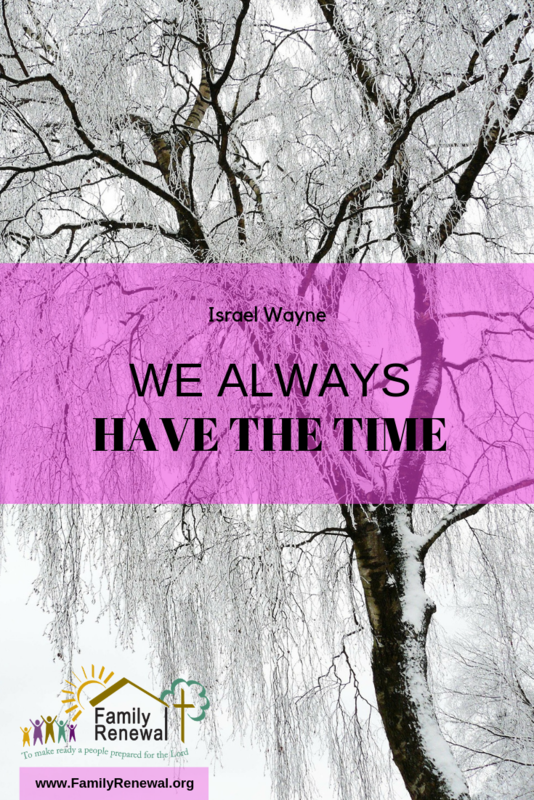 We always find the time and money to do the things that are the most important to us. Let’s not wait for a crisis to help us recalibrate our compasses. Take the time to write down the most important things in your life, and make sure that you don’t wait until it is too late to tend to them. 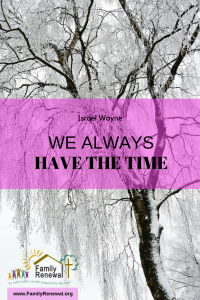 Israel Wayne is an author and conference speaker. He is the Director of Family Renewal and Site Editor for www.ChristianWorldview.net. He is the author of six books including Full-Time Parenting: A Guide to Family-Based Discipleship.